What do you do when you have tomatoes and green beans taking over your garden, peppers and squash all over your counter-tops, tons of website work you’re behind on, school books scattered all of the living room and kitchen, dirty dishes piled up, and laundry you can’t keep up with? You ditch it all and take a trip to Kansas, that’s what. The deal is, there’s never really a good time to get away. This time of year seems even more difficult with garden produce demanding such immediate attention. But hey, if you don’t just make it happen, you’ll never get around to it. And that is why, when we found exactly one free (ha!) day in our schedule that was close to my dad’s 65th birthday, we made a quick trip south to celebrate. I’m so glad we did! 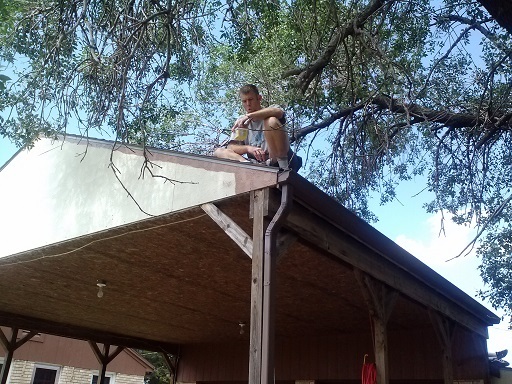 Matt…leaning over the side of the roof of the car port, holding none other than a margarine tub (full of paint). Asa…standing on – um, what do you call this? 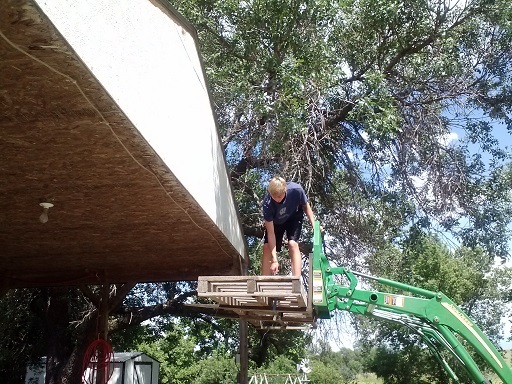 – tractor with boards lifting him into the air so he could paint the front of the car port. 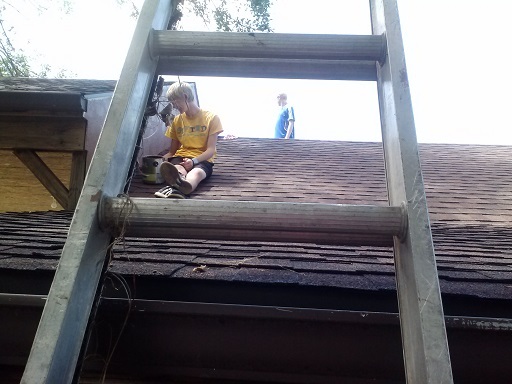 Justus and Elias…on the other side of the car port, sitting/walking on the roof and painting. Apparently Malachi had already done his part, and was (safely) inside the house helping Grandma Tacy get lunch put together. Ah, life on the farm. I think the boys all enjoyed themselves very much. 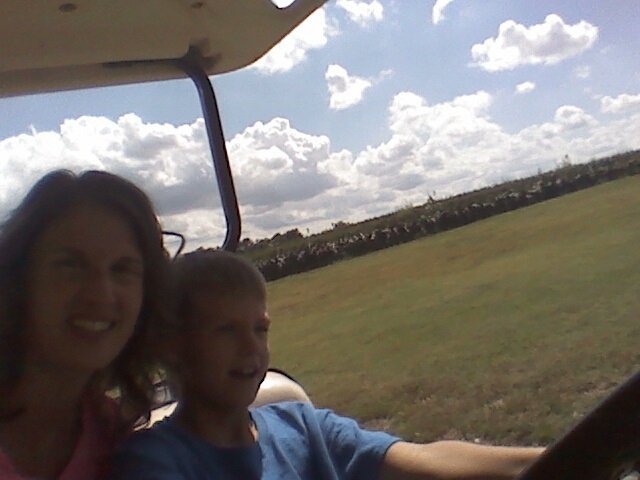 After lunch, Malachi took me for a drive in Papa’s golf cart. I promise I really am smiling in the picture below. It was a selfie, the sun was in my eyes, and I wasn’t at all nervous with my nine year old’s foot on the gas pedal. It was a fantastic time to be with family. The birthday party was fun, the cousins loved their time together, and we arrived home after midnight in time to catch some Z’s before getting up the next day and send our older boys off to a church youth event. 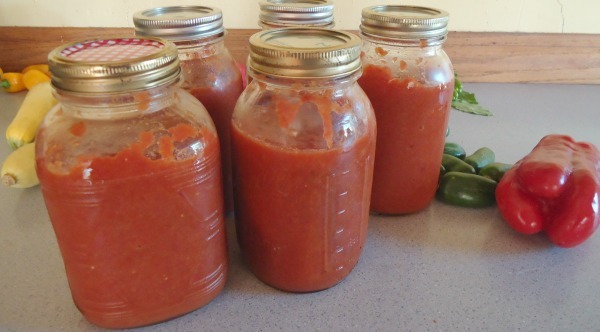 What have we been doing with all the tomatoes from our garden? 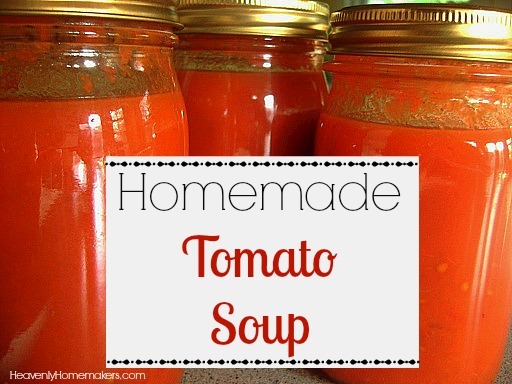 Well, this time, I made a batch of Homemade Tomato Soup. I left some room at the top of each jar to allow for expansion as I put them into the freezer to have this winter. No more traveling for our family for a while now – phew! We’re hitting Restart – and we hope you’ll be joining us! Settling into a routine (of some sort) sounds fantastic and refreshing. What are you up to this Labor Day Weekend? Are you hitting the restart button with us?